Information: Mary Wood Hinman (1878-1952), author of books and articles about folk dance. Mary was born in Ohio on February 14, 1878. At the age of 16 in 1894, she moved to the rather posh North Shore suburb of Kenilworth. Apparently, during a time of family financial distress, Hinman began teaching neighborhood children at home to help her family make ends meet. She seems to have enjoyed her teenage teaching experiences greatly, and studied gymnastics and folk dancing in Europe. She studied in Sweden's Lake Sylian, Mora, and Stockholm. After traveling to several countries to learn folk dances, she developed a teacher-training school in Chicago that prepared women to teach folk dances in schools, parks, and settlement houses. In addition to teaching, Miss Hinman staged pageants and programs of folk and "interpretive" dances in the school. Upon her return to Chicago, despite lack of any formal training, she began teaching dance in various schools, clubs, and hotels. 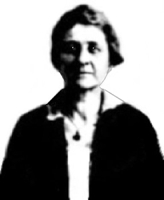 She managed to parlay her classes into a successful business, when in 1905 she began her Hinman School of Folk Dancing. She worked in Chicago to train teachers and encourage folk dancing among local ethnic organizations. Teaching at the Francis Parker School, a private school in Chicago, Illinois, as well, she inspired and encouraged the future great modern dancer Doris Humphrey. In about 1894, Mary founded International Folk Dance in Chicago. Around 1898, she started working with Jane Addams and her colleagues at Hull House, whose philosophy was to include the arts as part of an innovative program for the settlement and assimilation of immigrants into Chicago society. As the Hull House site states: "Hull House settlement workers saw the value of 'recreative pleasure' for young people doing the monotonous work of modern industry." Mary Wood Hinman taught folk dancing classes at Hull House as a way to hold the interest of immigrants and introduce their children to the music and dance of their native lands. Hull House settlement workers saw folk dance as a wholesome alternative to the restless dancing energy of the young, and provide social dances and classes as an alternative to the evils of the new city  dance halls, gambling dens, and saloons. Folk dance was also taught in the women's gymnastic program as a socially acceptable outlet for women's physical energies. Hinman fully absorbed the ethos of Hull House. As she was later quoted by Luther Gulick, "[it is] astonishing to find how many young men and women were given better positions by their employers after attending class for a month or two." Her motto became "let us not teach as much as share." She was always dressed in a gray accordion-pleated skirt with a blouse of the same material, a red sash, and gray dancing shoes. In 1904, Hinman established the Hinman School of Gymnastic and Folk Dance in Hyde Park, in order to prepare young women for teaching dance in public and settlement schools. She printed collections of English folksongs and plays, around 1912, for which she directed the dance numbers. In 1930 she helped establish the Folk Festival Council of New York; this private service organization sponsored folk dance festivals with performers from numerous ethnic organizations. In addition, she developed and taught a course titled "Dances of Many Peoples" at what is now the New School University in Manhattan. Hinman's influence and her philosophy became nationwide. She taught a series of courses at the New School for Social Research beginning in 1932. She also busied herself in the folk dance scene in the city. One of Hinman's more famous students was Doris Batchelor Humphrey, the dancer, dance scholar, and choreographer. Encouraged by Humphrey to film her modern dance works and get involved in choreographing dance in movies, California beckoned to Hinman, where she retired from her teaching career in 1938. She lived there until her death in Los Angeles on July 4, 1952. Clogs and Jigs, with descriptions (Her Gynastic and folk dancing), by Mary Wood Hinman, 1922. Getting Together, Fun for Parties of Any Size, by Edna Geister and Mary Wood Hinman, New York, NY: George H. Doran Co., 1925. Group Dances, Gymnastics and Folk Dances. 5 vols. (also called Gymnastic and Folk Dancing). Hinman, Mary Wood. New York: Barnes, 1918-1932. Gymnastic and Folk Dancing (Volume I - Solo Dances), by Mary Wood Hinman, New York, NY: A. S. Barnes and Co., 1916 (1922). Gymnastic and Folk Dancing (Volume II - Couple Dances), by Mary Wood Hinman, New York, NY: A. S. Barnes and Co.
Gymnastic and Folk Dancing (Volume III - Ring Dances), by Mary Wood Hinman, New York, NY: A. S. Barnes and Co., 1930. Gymnastic and Folk Dancing (Volume IV - Group Dances), by Mary Wood Hinman, New York, NY: A. S. Barnes and Co., 1924. Gymnastic and Folk Dancing (Volume V), by Mary Wood Hinman, New York, NY: A. S. Barnes and Co.
Hinman School of Gymnastic and Folk Dancing, by Mary Wood Hinman, 1915. Inspiration for Hostesses, by Mary Wood Hinman, 1918. Music for Hinman Gymnastic Dancing, by Mary Wood Hinman, 1911. Tap Dances, Clogs & Jigs (Sword dances and gymnastic dances for boys - Her Gymnastic and folk dancing), by Mary Wood Hinman, 1930.